Fair questions! But the answer is really found on a dusty page of Americana, three generations ago on a Depression Era dirt farm. That’s where my grandfather Samuel Herbert “Sammy” Drew grew up. Sammy was always a ‘fix anything’ type of kid. He had an American toughness born from tougher times. Local farmers and folks couldn’t buy new machinery. But there was nothing Sammy couldn’t fix. It’s what he loved. Sammy left to join the army and fought during WWII. After the war, he worked on oil platforms in Alaska and then the Gulf of Mexico. Through it all, he always kept helping everyone around him, fixing things that were broken. While living in Louisiana working the oil rigs, he started a small appliance repair shop. Folks would drop off their refrigerators, toaster ovens, and washing machines. My grandfather would fix them, often free of charge. When you focus on doing good work, trying to make customers’ lives better, at the end of the day you WIN. An offshore oil platform accident killed several workers and ended Sammy’s oil career. So he moved to Myrtle Beach and began repairing and maintaining air conditioning and heating systems at the Myrtle Beach Air Force Base. Then he worked as a maintenance and repair man for the famous Chapin Company of Myrtle Beach. But in his free time, he would still fix people’s window units, refrigerators and such, though he rarely charged money for it. He just did what he loved, fixing things for people. 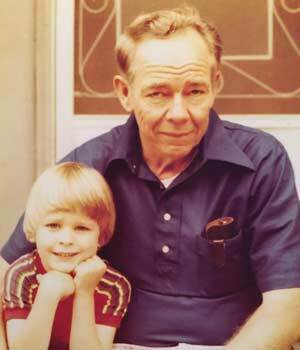 In 1978, my father Richard Drew was a Myrtle Beach police officer making $98 a week, trying to raise a family. He helped his father Sammy with the repair work in a small shop behind Sammy’s house. My dad kept saying they should open a REAL service company, to serve all the residents of the Myrtle Beach area. He was ambitious and young, and Sammy was a man that could fix anything. But Sammy didn’t care much about profits and success. It was often said that Sammy Drew would give you the shirt off of his back if you needed it. He and I had a very special bond, and I know the way I treat customers today comes from the way both my father and I learned to treat people, from my grandfather Sammy. Sammy died of a heart attack in 1978, in his sleep after attending my graduation from Vacation Bible School. It was the last time I heard him laugh or saw him smile. I can vividly remember holding on tight as he would carry me on his back, galloping like a horse while I was laughing. It was a devastating blow to the Drew family. My father had almost convinced Sammy to start that service company, but the dream was cut short. So he decided to prove to his dad that he could do it. To make his father proud. I believe this was his driving motivation from the beginning. So he started the heating and air conditioning company and nearly starved to death that first winter. But he and my mother decided to knuckle down, not give up, and try advertising with fliers on people’s cars at the mall. Well, they began to get a few calls and the summer of ’79 was a hot one, so they survived. A few years later my father teamed up with a friend named Maxwell who also had a small service company and they combined their businesses, forming A-Air Conditioning. The duo worked well until Maxwell wanted to go after commercial work. My dad wanted to remain focused on residential heating and air. So the two split and in 1983 Dad started Myrtle Beach Heating & Cooling. Over the next 14 years, he created a successful company taking great care of his customers and making money. He’d established a good reputation in the community. In large part, he did it for Sammy. 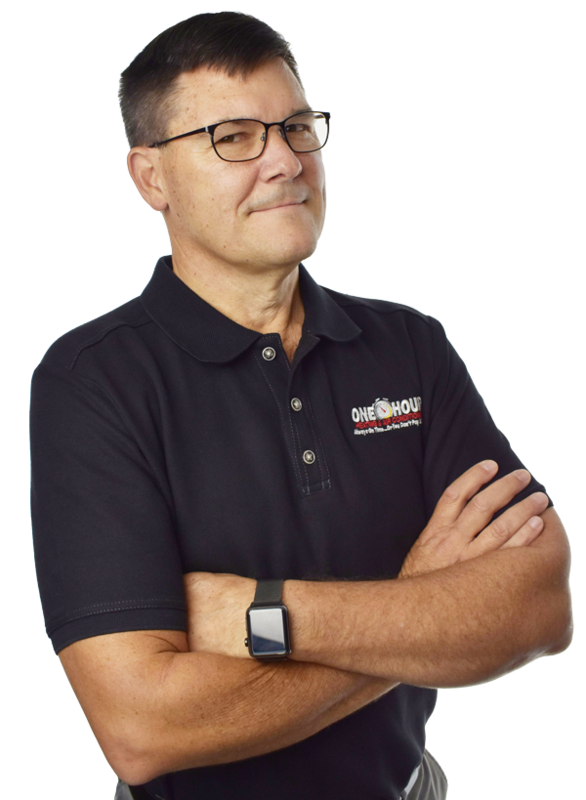 I joined my father’s business in 1995, as a residential maintenance tech, and began learning about the business. In 1997 my father became ill, so I had to step up to help my mother run the business. I had to learn a LOT, and quickly. So I went to school to learn how to manage and lead, at Contractors Success Group. I continued to run the business after my father recovered. In 2004 I suggested joining the One Hour team. The goal was to grow the business through One Hour to provide a retirement strategy for Mom and Dad. So that’s exactly what we did, and in 1996 I went to work for One Hour Corporate and Dad sold the business to them in 2007. So I worked my way up from a GM of the Las Vegas One Hour and eventually became Regional VP of all company-owned One Hour stores on the East Coast. So guess which heating and air company fell back under my management? …yep! Good ‘ol Myrtle Beach! As we grew I was asked to head a cost saving project by the parent company, Direct Energy. Since Myrtle Beach was a small, out of the way market for them, they asked if I would be interested in buying and running it! 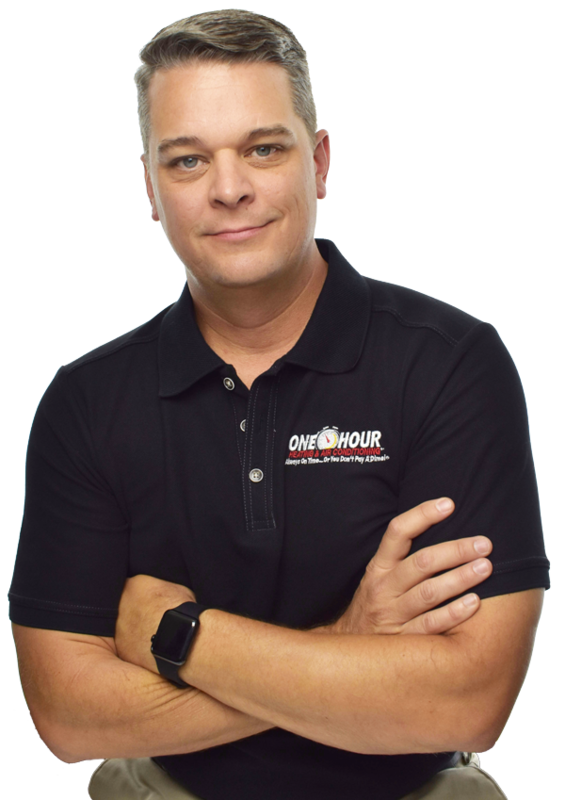 I knew with everything I’d learned over the last 18 years that I could grow this business into one of the most successful One Hour franchises in the country. So I purchased the business in June of 2013. Because we know: it’s happy employees that make happy customers! EXCELLENCE is what we want our customers to experience. But without HEART there can be no excellence. This is our identity, who we are as a company that wins both employees and customers. 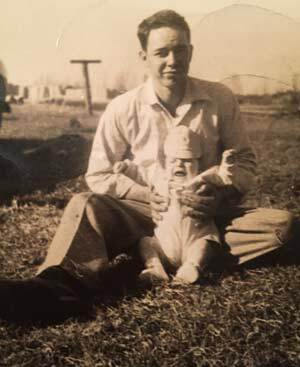 I had come full circle, and found myself a business owner like my father, except this was different: I hadn’t built it from scratch like he did. When I purchased it, it was already doing $5m in annual sales. It had 37 employees that had to be taken care of, as well as thousands of customers. To serve customers as well as he did, I would have to do things differently than a “corporate approach.” I knew I had to make the lives of my employees better. The good technicians were underappreciated, and they didn’t earn enough money. The heart incentives that lead to excellence were missing. So I made it my mission to raise the value and worth of a great HVAC tech. I pay my people better than anyone in the industry. Turnover is rare. I go to great lengths to make my employees feel like family and we create a culture where they come first. When Sammy met someone down on their luck who truly needed help, he would provide it. So now, when we have a customer in need and they’re afraid they can’t afford our service they call me or one of my managers because they know the heart of our business. We love to fix things, for people who need our help. I believe this. So did Sammy. My Operations Manager Marty, a firebrand of excellence, worked with me at Direct Energy back in the day. When I bought Myrtle Beach I immediately called Marty and said “you HAVE to come help me with this Marty. I need someone who really GETS it, that connection between heart and excellence. I knew Marty would focus in on all the details of delivering excellence and do it with heart. This has allowed me to focus on keeping the heart of the company true, and on a purposeful course. It has turned out to be a great combo. We have grown One Hour Myrtle Beach from a $5 million business into a $12 million dollar business in three years. That is straight from the heart growth, through excellence in what we really do: We fix things for people who need our help. I’m so proud of my team. Sammy is up there somewhere. And I like to think he’s smiling.